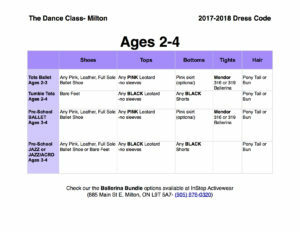 The Dance Class Boutique is the only place to get your Dance Class logo wear including dance bags, logo shorts and t-shirts! Open during our regular business hours, we also offer child and adult dancewear including leotards, shorts, tights and childrens’ ballet shoes. 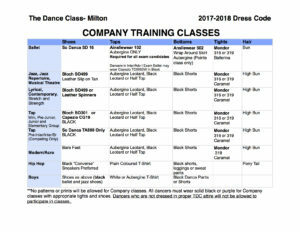 The Dance Class Boutique also recommends In Step Activewear Inc. as an excellent option for your dance wear needs. Pink leotard, pink tights and pink ballet shoes with suede soles. Pink skirt optional. Purple leotard, pink tights and pink ballet shoes with suede soles. Hair must be in a bun. 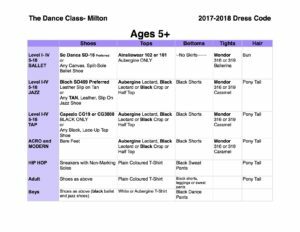 Black or Purple leotard with tan tights (optional) and appropriate shoes- Tan Jazz Shoe (jazz/musical theatre), Black Tap Shoes and Socks/Tan Tights (Tap) or Bare Feet (Acro/Tumble Tots.) Hair must be in a neat ponytail or bun. Clean Indoor Running Shoes (Black Converse Style works well), Track Pants/Shorts/Yoga Pants and a Plain T-Shirt. Plain colours t-shirt, black sweat pants or shorts with appropriate shoes as listed above in black.